Crock pot orange chicken and sweet potatoes are delicious. They are perfect for dinner, and most enjoyable with some sweet potatoes on the side. 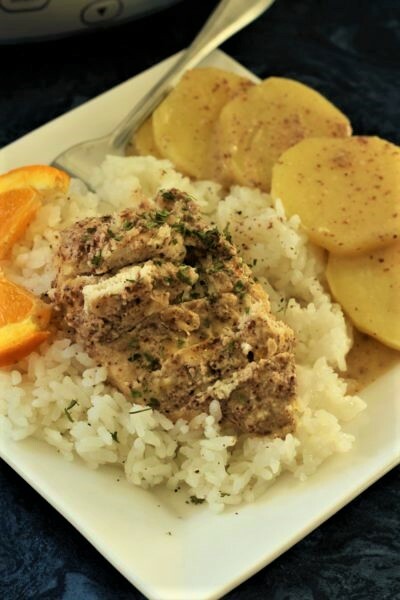 You can put your crock pot orange chicken over rice or even just eat it with the sweet potatoes. I made my crock pot orange chicken and sweet potatoes with some almond flour and so if you make it and it looks different, it is probably because of the four. My daughter has stomach issues and so we try to accommodate her most of the time. However, you can use whatever flour you like. Also, I am not a big fan of nutmeg, but this tastes amazing with the orange flavor. I love the combination of all the spices together! If you are not a big nutmeg fan, leave it out if you want or you could even use just a 1/2 teaspoon. We had a great weekend. It was a my grandson’s second birthday. He did get a few presents. 😉 Kids these days get a lot of fun things that I think I would like to play with. He got a little bike without pedals, that way they learn balance and they learn to ride without training wheels faster. He also got cute clothes and books, dinosaurs and cute characters from Disney World. Another exciting thing is that they had a gender reveal at the party for their baby that is coming in February. They gave the envelope to this sweet lady and she had a candy cannon. They gave her pink candy and blue candy. She put the pink candy in first and so they are having a girl!! Now grandma better get busy making a girl quilt. I know that summer is almost over and maybe there will be a little more time this Fall. However, you know that the holidays will be here before we know it. Are you all ready for the holidays? Out where my son lives, they have a family that has a fun water slide. They have these long belts and you get on a tube and slide down this belt with water running down it. I did not do it because I have done something to my back. Anyway, the kids sure did have a lot of fun. We also had dinner and it was amazing! We had pork sandwiches, fruit, chips, veggies and yummy salads. I bought cupcakes, mostly because of my back and I was working. The bummer about the cupcakes was that the frosting pretty much melted off! And if the frosting coming off the cupcakes wasn’t enough, the wind came up and blew them off the table. Yes, they ended up in the garbage. So glad that we ate 1/2 of them before that happened. Another reason I bought cupcakes is because I didn’t know how to transport 60 cupcakes. But we sure did have a great time. All the kids slept good that night. Even if they did have a lot of pink candy. We are so excited to meet this little girl. Now we just have to talk my daughter into telling us what she is having???? Now go make some crock pot orange chicken and sweet potatoes, and prepare to be wowed! 1- Use whatever kind of flour you want. 2- If you do not like mushrooms, then just leave them out. 3- If you have time, slow cook the crock pot orange chicken and sweet potatoes on low, if not it is great cooked on high too. 4- If you are not a big fan of nutmeg, use less or leave it out altogether. 5- Use fresh orange juice or some that you already have made. 6- Mine looks very spicy, but it is just because I used almond flour! In a medium to large crock pot, place the sweet potatoes in the bottom. Rinse the chicken and pat it dry. Combine the flour, salt, nutmeg, cinnamon, pepper, and garlic powder. Coat the chicken in the flour mixture. Place the chicken pieces on top of the sweet potatoes. Combine the soup with the mushrooms, orange juice, orange rind, brown sugar and the four. Pour over the chicken breasts. Cover and cook on Low for 6 - 8 hours or on high for 3 - 4 hours. I actually really like making quilts, especially baby quilts for my grandkids. I thought that I had a couple of posts on here with 2 of the quilts that I had made, but when I just looked for them, I don’t see them. They must not have gotten transferred over when I changed the blog. I’m going to have to go add them. Thank you for coming by and leaving a comment. I hope that you are able to try it. You used the kind of sweet potatoes I love!! Great recipe. Thanks for sharing at the What’s for Dinner party! Hope to see you next Sunday too. Have a wonderful week. I am with you, I do not care for yams. They are more orange and these are more yellow. I think that people get sweet potatoes and yams mixed up! Not me and you, thank you and have a great week. This looks fantastic. Pinning to try tomorrow. It really is fantastic. I hope you get a chance to try it.